As a result of the increased focus on modern compact machinery in industry, wear in lubricated contacts and the problems of running in, and scuffing has become the most important form of wear.Despite this trend, until now information on lubricated wear has been scattered across a wide number of journals, emphasizing only one aspect of the wear process. This new book is a unique resource, consolidating all the available information into one place. In doing this Sethuramiah, contributes significantly to the development of knowledge in the field, by highlighting knowledge gaps for future research. More immediate improvements in practice have been clearly identified with well-argued methodologies with which the present level of knowledge can be improved. This book will therefore prove an essential resource for all engineers and scientists with an interest in lubricated wear. 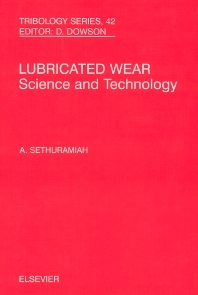 With 38 years of research experience in basic and applied tribology, Dr Sethuramiah’s major interest lies in boundary lubrication and wear. He has worked as a UNESCO fellow and as a research scholar at Tokyo Institute of Technology during 1969-73 where he was awarded a D Engg degree. He is a past president of the Tribology Society of India (TSI) and authored the book, ‘Lubricated Wear-Science and Technology’ in 2003. Currently he is pursuing his interest in tribology research through interaction with faculty and students at VIT Vellore, IISc Bangalore, and IIT (BHU) Varanasi. He continues his association at a national level as a life member of TSI through his teaching of tribology and related subjects. Dr Sethuramiah was awarded the lifetime achievement award in R&D by TSI.